Paris: Parisians gave thanks to see the bell towers and great stained-glass rose window of Notre-Dame still standing on Tuesday after firefighters laboured through the night to douse the flames that gutted one of the most potent national symbols of France. More than 400 firemen were needed to tame the inferno that consumed the roof and collapsed the spire of the gothic masterpiece. They worked through the night, finally quelling the blaze some 14 hours after it began. "Yesterday we thought the whole cathedral would collapse. 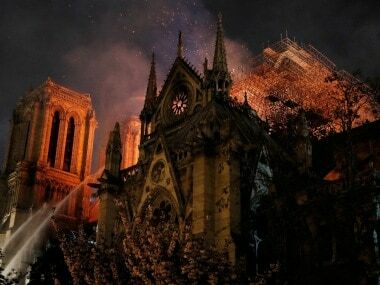 Yet this morning she is still standing, valiant, despite everything," said Sister Marie Aimee, a nun who had hurried to a nearby church to pray as the flames spread. From the outside, the imposing bell towers and outer walls, with their vast buttresses, stood firm, though the insides and the upper structure had been eviscerated. Paris public prosecutor Remy Heitz said there was no obvious indication the fire was arson. Fifty people were working on what would be a long and complex investigation, officials said. One firefighter was injured but no one else was hurt, with the fire starting at around 6.30 pm after the building was closed to the public for the evening. Firefighters examined the facade, with its spectacular 10-metre filigreed stained-glass, rose window still intact. They could be seen walking atop the belfries as police kept the area in lockdown. 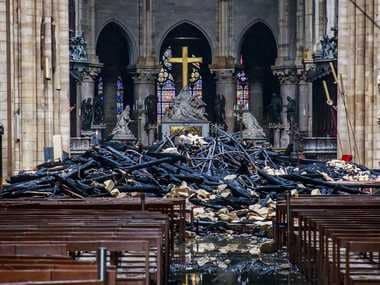 Investigators will not be able to enter the cathedral's blackened nave until experts are satisfied its walls withstood the heat and the building is structurally sound. The fire swiftly ripped through the cathedral's oak roof supports, where workmen had been carrying out extensive renovations to the spire's timber-framed supports. The Paris prosecutor has opened an investigation into "involuntary destruction by fire". Police on Tuesday began questioning the workers involved in the restoration, the prosecutor's office said. Hundreds of stunned onlookers had lined the banks of the river Seine late into the night, reciting prayers and singing as they stood in vigil while the fire raged. Pope Francis, the leader of the Catholic Church, was praying for those affected, the Vatican said, adding: "Notre-Dame will always remain — and we have seen this in these hours — a place where believers and non-believers can come together in the most dramatic moments of French history." Within 24 hours, companies and local authorities had pledged more than 700 million euros to rebuild it, including 500 million from the three billionaire families that own France's giant luxury goods empires: Kering, LVMH and L'Oreal. It was too early to estimate the cost of the damage, said the heritage charity Fondation du Patrimoine. Paolo Violini, a restoration specialist for Vatican museums, said the pace at which the fire spread through the cathedral had been stunning. "We are used to thinking about them as eternal simply because they have been there for centuries, or a thousand years, but the reality is they are very fragile," Violini said. The company carrying out the renovation works when the blaze broke out said it would cooperate fully with the investigation. "All I can tell you is that at the moment the fire began none of my employees were on the site. We respected all procedures," Julien Le Bras, a representative of family firm Le Bras Freres. Officials breathed a sigh of relief that many relics and artworks had been saved. At one point, firefighters, policemen and municipal workers formed a human chain to remove the treasures, including a centuries-old crown of thorns made from reeds and gold, and the tunic believed to have been worn by Saint Louis, a 13th-century king of France. "Notre-Dame was our sister, it is so sad, we are all mourning," said Parisian Olivier Lebib. "I have lived with her for 40 years. 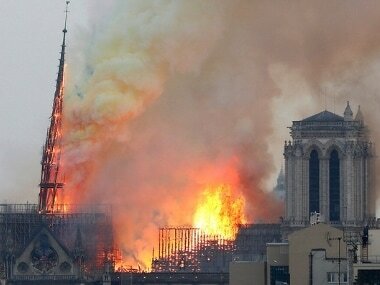 Thank God that the stone structure has withstood the fire.